"oldest continuously inhabited city" award. According to Phoenician tradition it was founded by the God El, and even the Phoenicians considered it a city of great antiquity. Although its beginnings are lost in time, modern scholars say the site of Byblos goes back at least 7,000 years. Ironically, the words "Byblos" and "Phoenicia" would not have been recognized by the city’s early inhabitants. For several thousand years it was called "Gubla" and later "Gebal," while the term "Canaan" was applied to the coast in general. It was the Greeks, some time after 1200 B.C., who gave us the name "Phoenicia," referring to the coastal area. And they called the city "Byblos"
(papyrus" in Greek), because this commercial center was important in the papyrus trade. Today Byblos (Jbeil in Arabic) on the coast 37 kilometers north of Beirut, is a prosperous place with glass-fronted office buildings and crowded streets. But within the old town, medieval Arab and Crusader remains are continuous reminders of the past. Nearby are the extensive excavations that make Byblos one of the most important archaeological sites in the area. About 7,000 years ago a small Neolithic fishing community settled along the shore and several of their monocellular huts with crushed limed stone floors can be seen on the site. Many tools and weapons of this stone age period have been found as well. The Chalcolithic Period (4,000-3,000 B.C.) saw a continuation of the same way of life, but brought with it new burial customs where the deceased were laid in large pottery jars and buried with their earthly possessions. By the beginning of the Early Bronze Age (about 3000 B.C.). Canaanite Byblos had developed into the most important timber shipping center on the eastern Mediterranean and ties with Egypt were very close. The pharaohs of the Old Kindgom needed the cedar and other wood for shipbuilding, tomb construction and funerary ritual. In return, Egypt sent gold, alabaster, papyrus rope and linen. Thus began a period of prosperity, wealth and intense activity. Several centuries later Amorite tribes from the desert overran the coastal region and set fire to Byblos. But once the Amorites had settled in, the city was rebuilt and Egypt again began to send costly gifts to Byblos. Treasures from the royal tombs of Byblos show the great wealth that flooded the city. About this same time the scribes of Byblos developed an alphabetic phonetic script, the precursor of our modern alphabet. By 800 B.C., it had traveled to Greece, changing forever the way man communicated. the earliest form of the Phoenician alphabet found to date is the inscription on the sarcophagus of King Ahiram of Byblos. 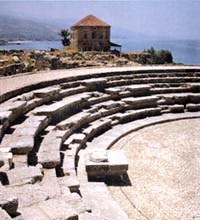 Throughout the first millennium B.C., Byblos continued to benefit from trade in spite of Assyrian and Babylonian encroachments. Then came the Persians who held sway from 550-330 B.C. The remains of a fortress outside the Early Bronze Age city walls from this period show that Byblos was a strategic part of the Persian defense system in the eastern Mediterranean. (National Museum of Beirut) After conquest by Alexander the Great, Byblos was rapidly hellenized and Greek became the language of the local intelligentsia. During this Hellenistic Period (330-64 B.C. 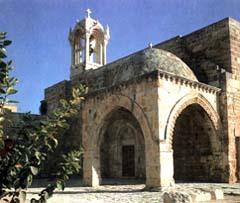 ), residents of Byblos adopted Greek customs and culture. Both the Greek language and culture persisted throughout the Roman era which was to come. other Phoenician cities, ruling them from 64 B.C. to 395 A.D. In Byblos they built large temples, baths and other public buildings as well as a street bordered by a colonnade that surrounded the city. There are few remains of the Byzantine Period (395-637 A.D.) in Byblos, partly because construction was of soft sandstone and generally of poor quality. became the see of a Christian bishopric. of St. John Under Arab rule beginning 637 A.D. Byblos was generally peaceful but it had declined in importance over the centuries and archeological evidence from this period is fragmentary. In 1104 Byblos fell to the Crusaders who came upon large stones and granite columns of the Roman buildings and used them for their castle and moat. With the departure of the Crusaders, Byblos continued under Mamluke and Ottoman rule as a small fishing town, and its antiques remains were gradually covered with dust. Before Byblos was excavated, the ruins of successive cities had formed a mound about 12 meters high covered with houses and gardens. The ancient site was rediscovered in 1860 by the French writer Ernest Renan, who made a survey of the area. In 1921-1924 Pierre Montet, a French Egyptologist, began excavations which confirmed trade relations between Byblos and ancient Egypt. Maurice Dunand began his work in Byblos in 1925 and continued with various campaigns until 1975. A thriving modern town with an ancient heart, Byblos is a mix of sophistication and tradition. 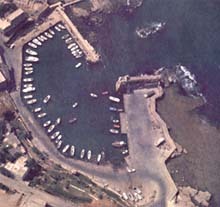 The old harbor is sheltered from the sea by a rocky headland. 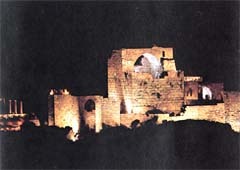 Nearby are the excavated remains of the ancient city, the Crusader castle and church and the old market area. half-ruins. Don't hesitate to explore. Should you happen to intrude on someone's property the hospitable townspeople will be pleased to show you around. After visiting the archeological site, a quick and entertaining introduction to Lebanon's past can be found at the Wax Museum near the castle. The wax figures illustrate scenes from the history and rural life of the country. There is a modest entrance fee. 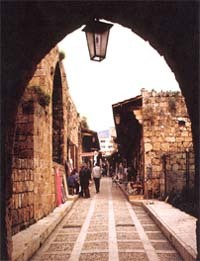 With its many restaurants, snack bars, souvenir shops and hotels, Byblos is well prepared to welcome tourists. Out of old Byblos and into the town's higher elevations in the foothills are a number of very old churches such as the catacomb-like Mar Nohra cut from rock and the Mar Semaan chapel. Just north of Byblos, Amchit sits on the coast and climbs briefly up the lower elevations of Mt. Lebanon. This town has the country's only organized campsite, a pleasant, clean place with attractive beaches available to campers. The town is well known for its lovely traditional houses. Among others, there is the home of the French writer Ernest Renan who lived in Amchit in the 19th century. Nahr Ibrahim, 6 kilometers south of Byblos. This valley of the ancient Adonis River is one of the most wild and beautiful in Lebanon. The road leads to the source at Afqa high in the mountains, where you will find the ruins of the great temple of Aphrodite-Venus in front of the cave.